Here & Now 2014, the month-long Black Choreographers Festival, comes to a close this weekend. 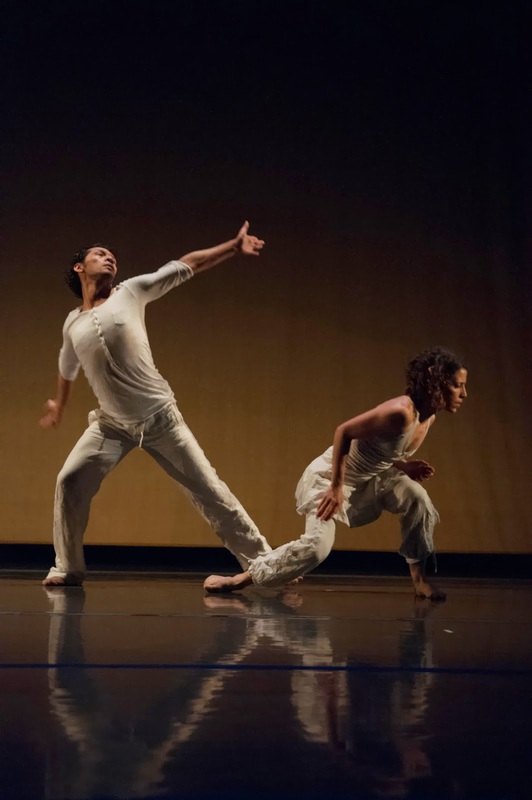 And for the final set of performances, Robert Moses’ Kin (in association with the Black Choreographers Festival and ODC Theater) brought ‘DRAFT/BY Series’ to San Francisco’s Mission District for three performances. This varied two-act program combined and highlighted two of Robert Moses’ Kin’s ongoing choreographic endeavors. ‘The By Series’ invites different choreographers to stage new work on Robert Moses’ Kin’s company dancers and this particular collection of world premieres featured Moses’ “Ark”, Bliss Kohlmyer’s “Snapshots of Longing”, Dexandro “D” Montalvo’s “Impulse” and Gregory P. Dawson’s “808 KICK revised”. “Ark” is all about structure and form. Abstract and postmodern, dancers sequenced through Moses’ choreography on the perimeter of the floor as well as in the center. Questions arose. How does movement look in different configurations? How can the angle and facing change physicality? How is the impact of movement altered by different points of staging? Next up was Kohlmyer’s narratively powerful “Snapshots of Longing”. A duet for Jackie Goneconti and Victor Talledos, “Snapshots of Longing” documented a passionate, desperate and at times, volatile relationship. Short scenes were separated by blackouts, though the emotion and charged nature of the piece held true throughout. While the final vignette calmed and slowed slightly, the drama from the rest of the dance hovered. This last portion was incredibly sad. Kohlmyer did not sum up the pair’s existence with a neat and tidy bow. Instead they experienced an acknowledgement and an acceptance of their flawed reality. Sitting in a place of precariousness is hard and Kohlmyer bravely left this story unresolved. Montalvo’s “Impulse” followed – a quartet for four women to a pulsating techno score. While unison dancing typically calls for exactness and precision, here, the differences between the dancers were celebrated. “Impulse” was an individual practice; each dancer authentically reacting to and cycling through movement. With “Impulse”, Montalvo has created a study of inherent personal dynamics. ‘The By Series’ portion of the evening concluded with Dawson’s “808 KICK revised”, an enthralling and somewhat ominous ensemble composition. Community and society were primary themes, and along those lines, some very slight influences of social dance (ballroom and line dancing) were present in the choreography. While on the whole, the piece was very contemporary, these characteristics crept in from time to time, and fit very well with Dawson’s choreographic vocabulary. Near the end, “808 KICK revised” had a dynamic crescendo and energetic ramp up in movement. Most of the dancers handled this well. However, a few cast members lost a sense of direction in their arms and shoulders, which took away from the powerful choreography. ‘DRAFT’ is the result of a very specific process – short choreographic variations created in a limited time period by a number of different performance artists. Then, these individual artistic experiments are stitched together into a large single work right prior to performance. This iteration of ‘DRAFT’ was fantastic; the ODC Theater stage was alive with a layered mosaic of choreographic ideas. A physical quilt of genre, style, intention and product led to a dynamic, varied and fun contemporary dance experience. Only one moment seemed out of place. Right in the middle, there was a type of ‘dance-off’ segment where two or more performers with different choreography met center stage, faced each other and danced. It just didn’t fit. An odd and unnecessary sense of competition was suddenly present in a work that up to that point had been a true celebration of community.